The Hartford Yard Goats are known for their game-day entertainment, but this year there is something new to look forward to. The Hartford Yard Goats Dance team debuts before the first pitch of Thursday’s home opener and the team is made up of local kids. “First Hartford Yard Goats Dance Team, we are super excited,” said 14-year-old Maya Fountain, one of the around 50 dancers on the team. All of the team members are between the ages of 8 and 18 years-old. “We are very excited but very nervous,” Maya said. The journey has been fun, but not easy for the dancers. 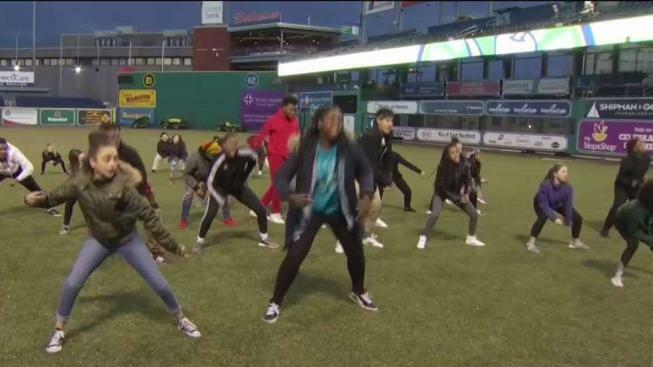 Before dancing through the halls and onto the field of Dunkin’ Donuts Park, hundreds of kids auditioned in December for a spot on the team. “I feel really excited and humble to be able to have this opportunity, to show my talent to the world,”12-year-old Jacob Rodriguez said. After five rounds of cuts, Rodriguez was one of the talented kids selected to the group. Studio 860 instructors from Hartford coach the dance team and the dance studio partnered with the Hartford Yard Goats to help create the specialized pre-game performances. The YG Dance Team has been practicing every Friday night since January and after their big debut on Thursday, they will continue their performances during Friday night home games in Hartford. “Come every Friday night to watch the kids,” said Charlene Fortenbach, whose son, Nick, is from Tolland and dances on the Yard Goats Dance Team. Parents said the rehearsals have been a secret, therefore seeing the performances will be a wonderful surprise. What is not so secret are the friendships that complete this team. “They love it! They are meeting kids from all different studios, all different towns,” Fortenbach said. Now these goats hope to be the greatest of all time dance team to hit it out of Dunkin Donuts Park and into Hartford’s heart. “I know we are going to kill it and I am just excited to present everything that we have been working so hard on,” said 18-year-old Nadja Johnson, one of the team captains of the YG Dance Team.